When friends are over there sometimes is nothing better than a game of foosball. Whether playing with one other person or you’re going two on two, you need a quality foosball table that can provide an excellent level of play. The Atomic Pro Force Foosball Table may just be the right table for you. 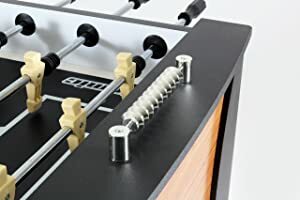 It has a lower price tag than many other options on the market, and while some of the materials are not as high grade as these other options, it is hard to beat what Atomic Pro Force Foosball Table comes with the price. This is a casual table for those who want to add a foosball option to their game room. It might not be heavy duty enough for bars and clubs as the legs are not designed to take excessive weight pushed up against the legs, but in terms of home use, it does offer a nice opportunity. Internalized ball return and ball entry so you can easily start your game. 3.5″ Leg for even playing. If you have ever played on an uneven table you know just how difficult this is. With the Atomic Pro Force Foosball Table, you can correct any even problems and always have a secure table ready for you to start up with. Heavy duty legs and steel parks make it a secure table that can take more household movement. It will not collapse under additional weight from playing. Perfect for the house. It is a solid construction, and yet not heavy to the point where it is impossible to move it. From time to time you might need to move the table to make room for other household activities. Plus, with the foot pads and on carpet, you can probably pull or push the table on your own without too much trouble. The design look. It looks great, has an excellent color look between wood and steel. It makes playing easy and it won’t stand out of place. The price tag is nice for the quality of build. It is possible to pay much more on a foosball table, which is why this is such a solid opportunity for you to take advantage of. Beautiful looking stainless steel scoring panel. This area really stands out and is a great addition to the top of each side. Rubber grips and octagonal handles to provide exceptional comfort and holding potential. Dimensions for the foosball table includes 29.5 inches wide, 56 inches long and 34.5 inches tall. Player design. While there is nothing terribly wrong with how the plastic figures are designed, the corners of the figures are not as cut and edged as you might want. Due to this, some passing may not be as crisp as what you can find on other, higher-end tables. For the casual fan this shouldn’t be an issue, especially as it is found on all of the figures. 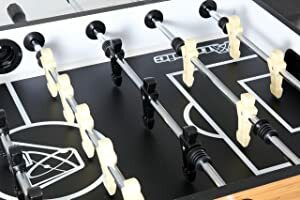 However, for those truly experienced with foosball and who want to avoid this issue, you may want to look for something else, or at the very least trade out the figures. More balls are needed upon buying the Atomic Pro Force Foosball Table. Four balls do not last long with a foosball table, especially in a household with children. It is better to have more balls at once, and while this is a minor inconvenience, it is something to keep in mind. The everyday house. 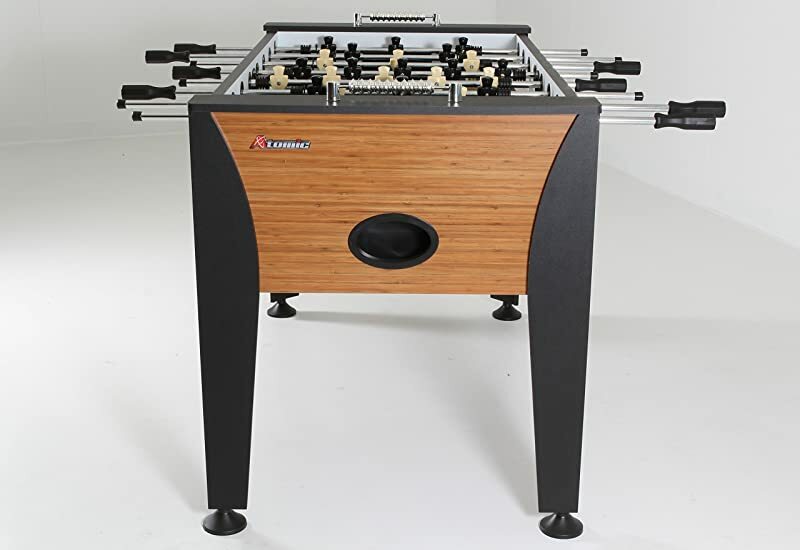 If you have been looking for a nice foosball table to add to your game room and just don’t want to spend the thousands of dollars on higher-end tables, this is a great fit. It works well in most spaces, can be easily moved and yet is heavy enough to provide a solid game. High-traffic areas. If you are looking for a table to include in your bar, college dorms or other locations where a good amount of foot traffic is involved, this might not be the option. While it is designed to be strong and hold up against general usage, in a bar setting this probably isn’t the best option as it can be knocked over or moved far too easily. The Atomic Pro Force Foosball Table is a quality foosball table. Although there are a few minor issues here or there, for the most part it is a great piece of equipment, especially for the price. You can pay far more than this for other foosball tables that don’t provide all that much better user experiences. 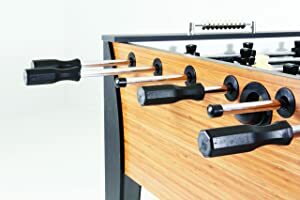 So, whether you have never played foosball before and you just want to break into this kind of gaming world or you want a quality device that doesn’t cost much, the Atomic Pro Force Foosball Table is a nice option to go with. Now, this is not the kind of table you want to use in a bar setting as it will slide and move too easily. But, for the family room or game room, this is something that can bring friends and family together. So, instead of shopping around for something more expensive, you should check out the Atomic Pro Force Foosball Table.